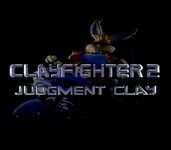 "C2: Judgement Clay, also known as Clay Fighter 2, is Interplay's 1994 sequel to ClayFighter. This game was not as well received as its predecessor. Its name is a parody of Terminator 2: Judgment Day." Source: Wikipedia, "Clay_Fighter_II," available under the CC-BY-SA License.